For most people, choosing a Garden Building is very much the easy part, and most deliberation is spent over exactly what colour finish to go for on the exterior. 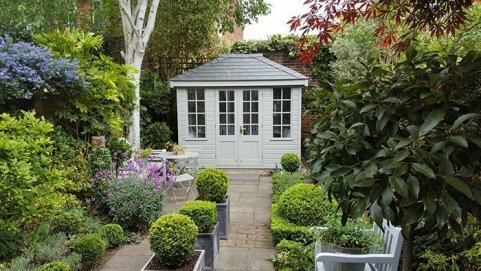 At Crane Garden Buildings, we pride ourselves on having a vast range of options to suit all tastes, gardens and budgets. From the Sikkens wood stain available on our sheds, to a collection of Farrow and Ball paints available on most products, we can offer the perfect palette from which to choose. Crane offer 5 different types of finish, some of which are exclusive to a particular product type. For example, our Sikkens wood stain range is only available on our Sheds and Garages, whilst our Valtti paint range is available across all products except Classic Sheds and National Trust products. Classic Sheds are only available in either our Light Oak preservative stain or in the three attractive colour options of Mint, Moss or Stone. Our Farrow and Ball range is compiled of 12 specifically-selected shades available on our Garden Rooms, Summerhouses, Studios, Superior Sheds, Garages and Greenhouses. We also have a National Trust collection in a choice of 6 colours that are timeless, traditional and tastefully understated. Your colour choice will often depend a lot on the type of product you select, for example certain products have specific colour palettes assigned to them from which you can choose. In order to make this process easier, we have created a fail-safe guide as to how to choose your exterior paint colour, just scroll down to see it! It is essential that you consider what style and mood you are going for with your chosen building as the colour and cladding choice will reflect this. 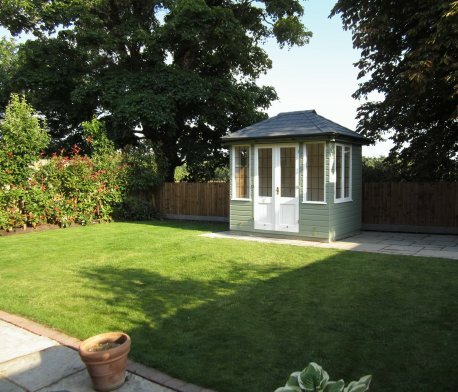 For example, who have a classic summerhouse in mind may opt for one of our Wivetons in a two-tone paint style to give off a traditional and classical look, in colour shades such as Valtti Lizard and Ivory. Someone after a contemporary and sleek Garden Studio will opt for a Salthouse Studio with smooth, shiplap cladding painted in perhaps Farrow and Ball’s Manor House Gray. Therefore, before selecting your colour choice, ask yourself exactly what style you want to obtain with the building. Is it a simple garden addition where you wish to still be able to admire the natural grain of the wood? Is it the main feature of your outdoor space that needs a striking opaque finish? Or is it something that needs to suit a defined purpose such as an agricultural or business need? Leading on from your personal style and requirements, the setting of the garden building will also play a huge roll in deciding what shade it should be. For example, a whimsical, floral garden teeming with wildflowers and wispy shrubs would be perfectly matched with an ivory or cream colour that will stand out and complement, rather than clash, with any bright-coloured flowers and foliage. A pristine garden that has been landscaped to perfection and boasts clean-cut angles has two different options with colour choices. Be bold and go for an unusual colour that will stand out and be a striking feature, or instead continue the minimalist theme and opt for a subtle, darker shade such as Farrow and Ball’s ‘Down Pipe’. 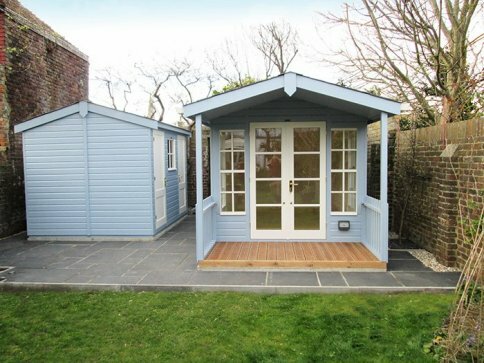 A particularly memorable example of a customer with specific settings is shown in the picture below whereby our Morston Summerhouse and a Superior Shed were painted to match the customer’s house which was also varying shades of blue and white. 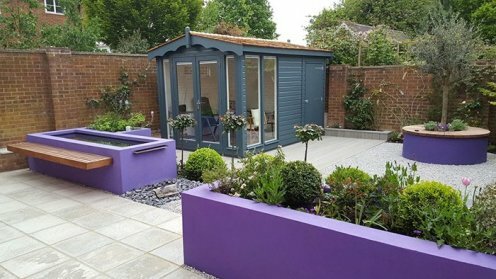 Some of our customers have a dedicated colour scheme to their outdoor space, and we understand that our particular selections may not offer the colour that they have in mind. this is the case, Crane are happy to provide a colour match from our Valtti range or they can choose a different Farrow and Ball shade from the exterior eggshell range. If you’re still unsure on what finish to go for on your tailor-made garden building, you can order samples from each of our ranges or even better, pay us a visit to see a selection of our Garden Buildings with various finishes. Alternatively, get in touch for some expert advice from our friendly advisors.